my favorites are the Dead Sea Mud and Tea Tree Oil soaps. They smell amazing and make us feel good about what we are putting on our skin. We love that they don't contain any toxic or "filler" ingredients and are safe for the whole family. We are so grateful we found them. The best soap I have ever used, hands down. I've even converted my boyfriend! We both have sensitive skin, and this soap does ...read morenot irritate or dry, and we love that the ingredients are natural and simple. We've been using it for over a year now, and will NOT buy any other brand. I even carry it when we travel! I love soap, especially Beecology soap. I wash my hands all day, so it's important to me that I use something that is nourishing and not damaging. Beecology soap is made with the finest ingredients, and what's better is that a portion of every purchase you make is donated to charity. What a great brand! 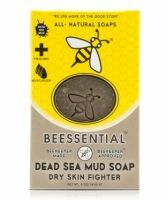 I tried a few of Beecology's bar soaps and found that the lavender was by far my favorite. While it doesn't generate a super amount of lather, the lather it did make was creamy, plenty moisturizing, and spreadable enough to use for winter shaving. Since I let it dry between uses, it lasted at least 2 months. Although it is not as moisture-packed as a Dove beauty bar, this turned out to be a great bath bar for my skin last winter (Midwest). All-natural soaps are quite popular around here and sell for premium prices at farmer’s markets. These soaps don’t smell like the typical soaps you may be used to. They have a strong out-of-the-box smell that some people don’t care for. There’s a distinct smell that goes along with handmade soaps infused with essential oils. Of course if you need fragrance-free soaps, you should take a pas...read mores. These soaps are very beautiful and are especially appealing with the honeybee that’s blindstamped into the center of each one. The Lavender & Honey and Totally Hip Hemp soaps are marbleized, an especially nice touch All of these soaps are great mild moisturizing soaps, but don’t lather up as much as the traditional soaps. Each one of these soaps have the same basic ingredients, the soothing healing oils that make these soaps great. The difference comes with the addition of the coloring and essential oils, which is a matter of preference. The Lavender and honey has the most pronounced fragrance, while My Gig Fat Greek has the least. I’m leaning toward favoring My Big Fat Greek with the hint of juniper. They are all wonderful soaps and they are all made with care I love the way they keep my skin smooth and soft.